It’s expensive traveling to Staten Island from Brooklyn or New Jersey by auto on any one of four bridges, but getting there by boat from Manhattan is free of charge. I ride the Staten Island Ferry on weekends for the most part, especially in fall and winter when the leaves are down, for neighborhood shoots for my website forgotten-ny.com. On the weekend I often find myself one of the few New Yorkers on the boat and one of the few non-tourists (though I consider myself a tourist in my own city), and mostly everyone exits the boat at the terminal and gets the next boat back to Manhattan. Simply riding back and forth between Staten Island and Manhattan on the same boat is not permitted. Needless to say, I find Staten Island as interesting, if not more, than the other four boroughs—New York is blessed to be a “water city” that was built along estuaries, rivers and on islands, and has multiple bridges built over the course of two centuries, with more on the way (the new Kosciuszko Bridge between Greenpoint and Maspeth is due to open by the end of this decade). There’s one ferryboat I’m always glad to board. Just as I’m happy to get a Long Island Rail Road M3 train set, which was instituted in 1972, or R-46 subway cars, which started rolling the same year, I like to be on the John F. Kennedy ferryboat, because it’s the oldest one in the fleet and retains most of its original design. The JFK was first launched in 1965, when Robert F. Wagner was serving out his final year (of 12) as mayor, and was of course named for the 35th US President elected in 1960 and murdered in Dallas in 1963. Thus, with little fanfare, the JFK celebrated its golden anniversary in 2015. The John F. Kennedy can safely transport 3500 passengers, is 297 feet (91 m) long, 69 feet, 10 inches (21.3 m) wide, weighs approximately 2110 gross tons, runs on 7000 horsepower engines and runs at an average speed of 16 knots, or 30 MPH. After 50 years of service it’s still considered the safest boat in the fleet. The JFK is due to be retired before the end of the decade, however. New ferryboat designs are being discussed, and since the JFK is considered a crowd-pleaser with plenty of outdoor deck space for sightseeing and more than adequate seating, new designs are said to be hewing more closely to the JFK’s design that the more recent class, which has been deficient as far as outdoor seating is concerned. I’m also not a fan of the multicolored plastic seats on the newer boats. The windows have rounded edges and heating vents are right along the windows. In spots, windows can open if you’re seated inside but still desire a cool breeze in the warm months. 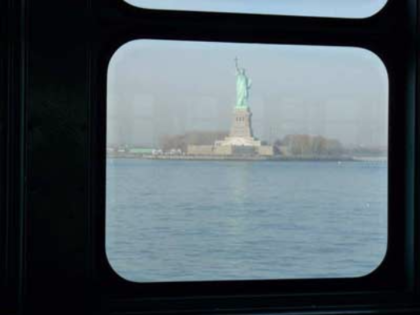 As the boat passes landmarks like the Statue of Liberty, the rounded windows serve as a picture frame. You do have to wait to center the object just so—I shot this just a second too early and so it isn’t quite centered. Remember, the boat moves at about 30 MPH. The effect reminds you of a motion picture. Think of the revenue the Metropolitan Transit Authority would earn if the ferry cost $2.75, to match the bus and subway fares. SI ferryboats are almost always packed with commuters in the mornings and evenings, and tourists in the hours between and after. Is it time to begin thinking about a ferry fare at a time when the MTA is strapped for money, no matter how high the fare is raised? Some Staten Island politicians think so, and have floated plans to charge tourists a fare, but not commuters. I’ve no idea how the difference would be ascertained without an elaborate screening process at either terminal. At this point a fare is unlikely, and I’m not endorsing such a move. The JFK has plenty of standing room on the decks and people take advantage, no matter how cold. Life jackets are stored in a bin on the roof. Note the traditional ferry lighting, an incandescent bulb in glass surrounded by a metal frame. 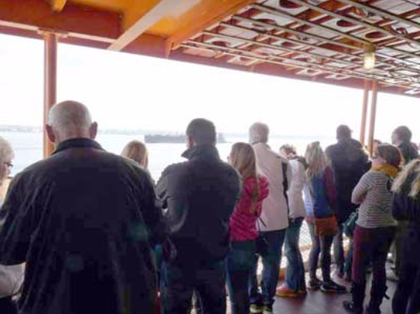 While outdoor side seating is available on the JFK, most passengers prefer to stand and move about to maximize the available scenery on both sides of the boat. The John F. Kennedy has just a few years left. Ride it now to experience old-style NYC ferryboating at its best. Plenty of other ferries are running—especially the East River Ferry connecting points in Brooklyn, Manhattan and Queens—but there’s no substitute for the Staten Island.